Plot: An escaped convict hides in the home of a shut-in mom and her teen son. While the police search for him, he and the mom fall in love. It's easy to see why this movie was released in January. It really has nothing to offer the audience for the first 90 minutes of the movie. Josh Brolin plays a compelling anti-hero, but the script doesn't give him much with which to work. 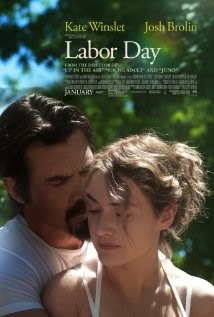 LABOR DAY is full of contrived suspense and the fact that the main characters fall madly into lifelong love over the course of a long weekend makes the This-Feels-Fake Meter move a lot. If you're looking for a slow-moving, slightly suspenseful love story you may like this movie, but chances are you'll walk out disappointed and wanting a large slice of homemade peach pie. Plot: Three friends make a pact to stay out of deep relationships until one of them is ready to move forward. THAT AWKWARD MOMENT is basically one big awkward moment because it's a romantic comedy for guys. It follows the same tried and true formula for RomComs, but is full of raunchy jokes and typical 20-something guy behavior. The movie has a few good laughs and a couple of horrifically awkward moments, but there isn't an audience that is going to like this movie in it's entirety.